LONDON — At Qatar's embassy in London, a screening of the Asian Cup final used a feed from the country's sports network. Qataris in the rest of Britain had to give money to betting companies to view the nation win its first major soccer title. 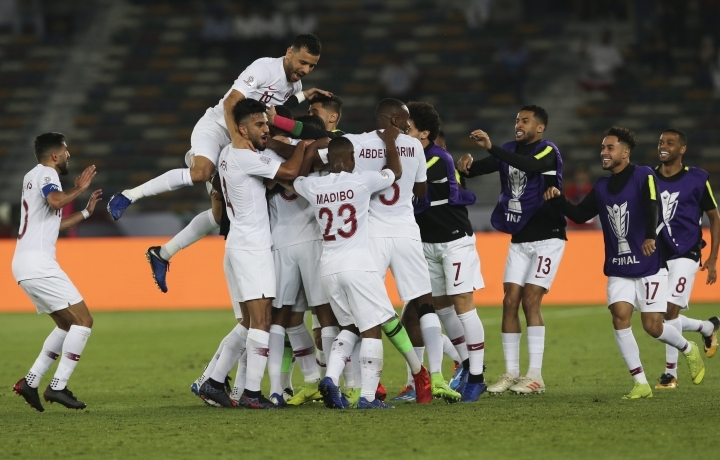 The Asian Football Confederation sold its broadcast rights to betting companies who offered digital streams for a tournament being staged in a Muslim nation — the United Arab Emirates — that ended up with another — Qatar — contesting Friday's final. Qatar beat Japan 3-1. The rights deal in Britain was the result of a lack of interest from broadcasters and concerns from the AFC that streaming the tournament on YouTube would make it too easy for a feed to be pirated in regions where rights are valuable — particularly the Middle East. AFC spokesman Colin Gibson said "we have no idea about this" and added in a later email that the broadcast rights are sold by Lagardere Sports, not the AFC. Gibson declined to discuss the religious sensitives and how the deal is reconciled with an AFC code of conduct which states, "We do not take part in betting connected with football." Lagardere Sports executive vice president of media, Nikolaus von Doetinchem, said the company acted as a broker between the AFC and the Perform Group on the betting company deals and said the streams were intended for existing account holders. Von Doetinchem said it was an "unfortunate situation" that Qataris, or other fans whose religion prohibits gambling, had to sign up to such services for the Asian Cup. "Normally you would have a licensee with a broadcaster, which in this case didn't happen because we didn't get any offers from a U.K. broadcaster," von Doetinchem told The Associated Press by telephone. "Normally in markets when rights are not sold, they are put on a website and streamed for free, but in this case the probability that gets pirated by the Saudis is too high to risk it." The AFC last month denounced the Saudi Arabia-backed pirate network beoutQ for the "persistent and illegal screening" of games for which Qatar's beIN Sports owns the Middle East rights, including the Asian Cup. The theft of broadcast rights is a proxy fight in the 19-month political and economic boycott of Qatar by regional rivals, including Saudi Arabia and the United Arab Emirates. Although beIN Sports cannot be viewed in Britain, the Qatari embassy was showing that network's feed at a screening attended by 2022 World Cup organizing head Hassan Al-Thawadi. While many club sides are sponsored by betting companies, it is unusual for a confederation to be in business with them. FIFA, which organizes the World Cup, said it doesn't sell any rights to betting companies. "We sell platform neutral rights to media rights licensees," FIFA told the AP. "All sublicense agreements are subject to FIFA approval, and there are no betting companies."